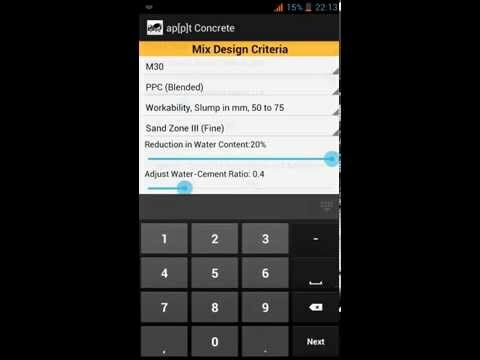 With the all-new Concrete Mix Design App, you can finalize mix proportions for M25, M30, M35 & M40 grades of reinforced concrete for variety of parameters in a jiffy. To further enhance the user experience, ap[p]t concrete has been equipped with an additional feature which allows you to work out mix proportions for various grades of concrete at different water-cement ratios making it a truly versatile tool a Civil Engineer would always look for. The method of proportioning is based on IS Code: 10262-2009. Go ahead and get the best out of it!